As you probably know by now, I am a huge fan of portability for video shooters and editors. 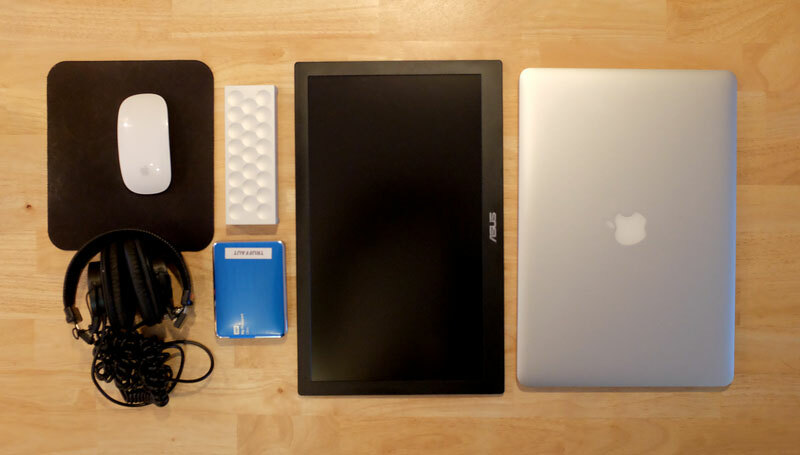 Last week I saw a tweet from @PhilipBloom about his new backpack kit, featuring his Mac Pro tower, and a new lightweight, thin monitor, the Asus MB168B+. 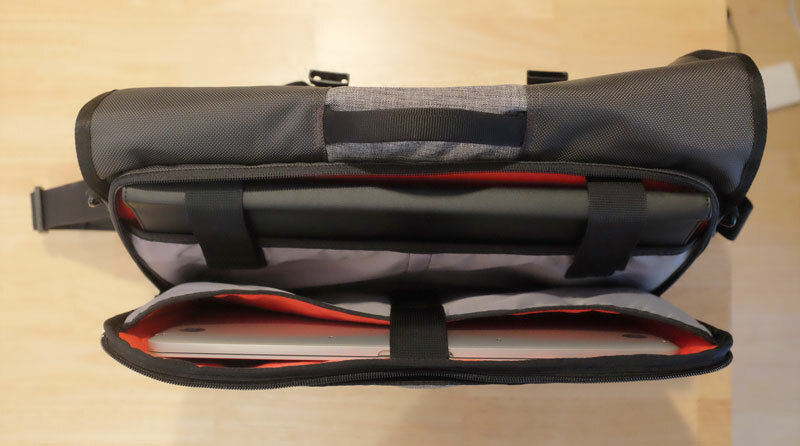 OK, that sounds pretty awesome – a state-of-the-art desktop editing bay in a backpack. But for us Macbook Pro users, this new monitor is the beginning of something entirely different. 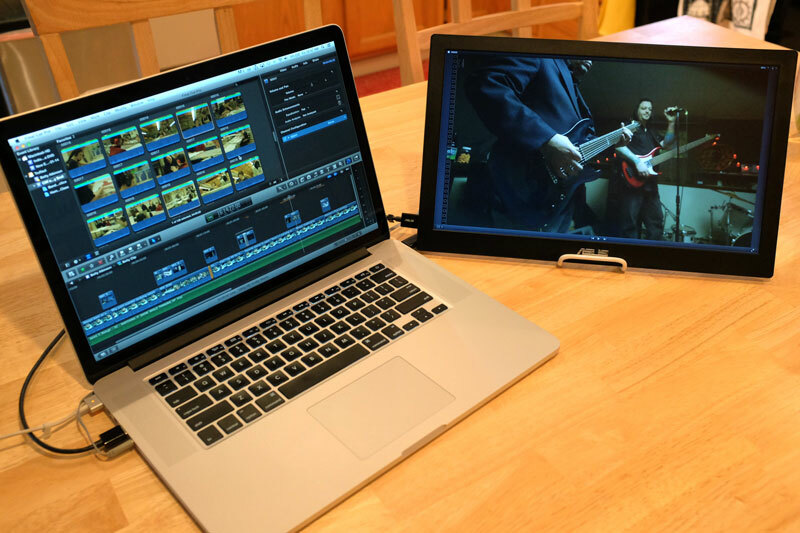 Dual Screen video editing, everywhere your laptop goes. 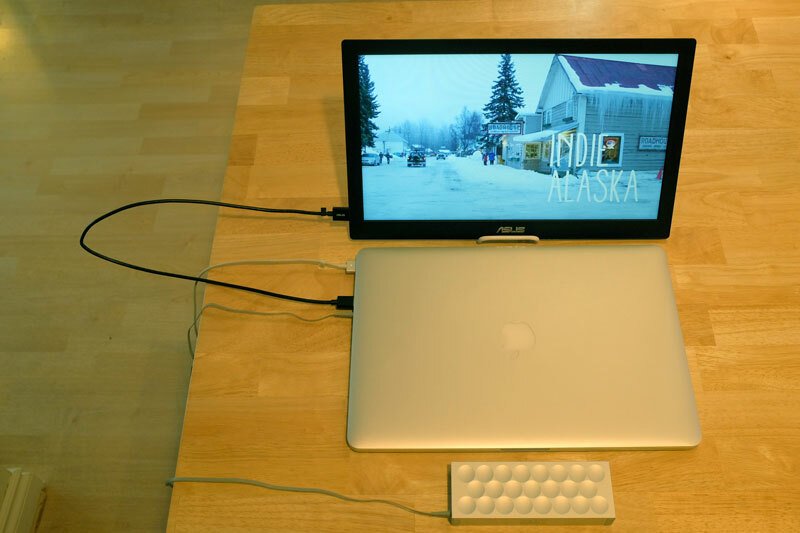 Full 1920×1080 resolution on a 15.6″ screen, as light as an iPad, no power cords (power comes through the USB3 cable). 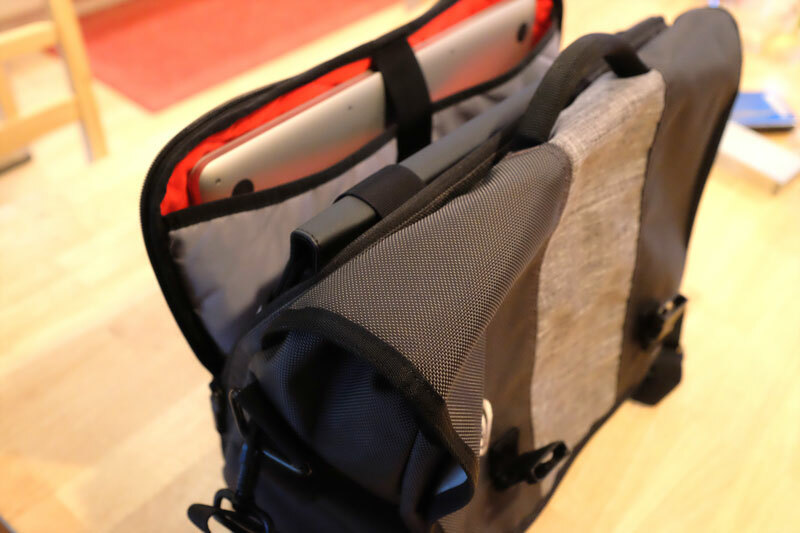 The Macbook Pro 15″ Retina and the ASUS MB168B+ fit in the back part of the Timbuk2 Commute medium backpack. This leaves the front part of the backpack for all your other essentials. Until now, for dual monitor editing, I’ve had to setup my heavy 24″ monitor, AC adapter, HDMI cable, along with a big riser for the Macbook (to sit at the same height as the monitor), along with other accessories – and that setup turns my kitchen table into a mess. The other option was to setup Air Display and use an iPad for a second monitor, but it’s laggy, complicated to setup, and not quite large enough. This setup, on the other hand, is so tiny that I can fit the entire “editing bay” into the laptop compartment of a backpack. Along with the Macbook and ASUS monitor, I’ve got a magic mouse, a Mini Jambox for audio, Sony MDR-7506 headphones when others are around, a WD My Passport Ultra 2TB drive, and that’s it! You can also use the monitor for presentations. 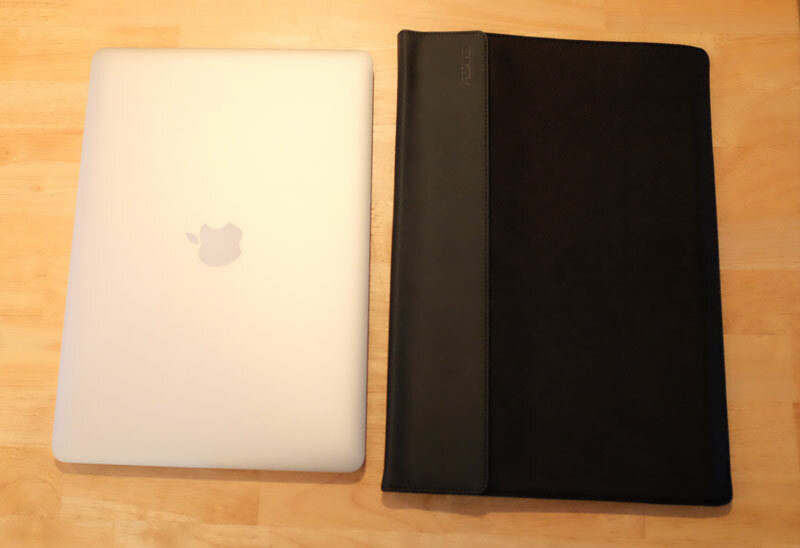 It continues to work even with the Macbook lid closed. 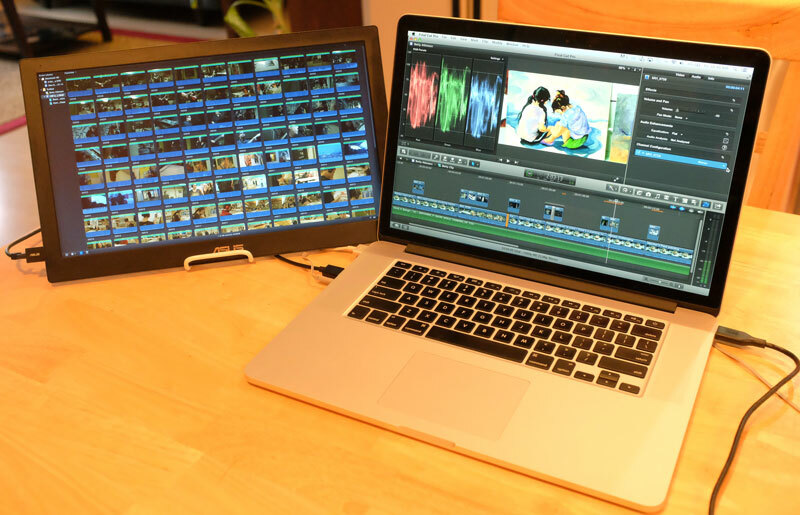 When editing in Final Cut Pro X, you can use the second monitor for two solid purposes. 1) Show all your events or favorited event clips on the ASUS display, with the project timeline and viewer on the Macbook. Or for a second opinion on color correction, you can use the ASUS screen as your viewer display. The colors and contrast are different than the ultra sharp Retina screen, so it gives you another chance to see your project the way others might see it. The ASUS MB168B+ (mind the plus sign, the MB168B is an older monitor with a smaller resolution) sells for $199. The drivers don’t fully support Macs yet, so you can’t use the monitor in vertical mode like you can on a PC, and the physical brightness buttons on the side of the monitor don’t do anything when connected to a Mac. Until this is fixed, you can either live with the ASUS’s default brightness (which is like 75% or so), or you can install the drivers on a PC machine, set the brightness to 100%, and that brightness setting will then carry over to your Mac. I actually did this and I highly recommend it – time to dig out that old PC. You might also want a longer and more quality USB 3 cable, and a different stand than the so-so carrying case ASUS provides.